Leaders of the Bangladesh Merchant Bankers’ Association on Monday requested the Securities and Exchange Commission to review its decision to impose a net asset value based calculation system for margin loan. The Therapeutic Goods Administration (TGA) of Australia accredited Eskayef Bangladesh Ltd, a leading local pharmaceutical, for its new world-class facility at Tongi. Eskayef is the only company in Bangladesh that achieved both the UK MHRA and TGA, Australia. The country’s largest private carrier GMG Airlines will operate scheduled flights from Dhaka to Jeddah during the upcoming hajj period. Standard Chartered Bank and Energypac Engineering Ltd closed the first metal derivative transaction in Bangladesh. Bata Shoe Company (Bangladesh) Ltd chief financial officer Mc Yee Slew NG inaugurated the offer in Dhaka on Sunday, said a news release. Mercantile Bank has opened its 57th branch at Chhoto Bazar in Mymensingh town. Chairman of the bank Md Abdul Jalil inaugurated the 57th branch as chief guest on Sunday, said a news release. THE month-long Rajshahi garment, loom products fair and hena festival at Green Plaza of the city corporation is drawing a huge crowd which peaks every day evening after ifter when the city dwellers and people from the city suburb crowd the fair for Eid shopping. Zafrun Nahar had spent five years trying to have her son’s killers punished. But no witness showed up to testify at the trial. 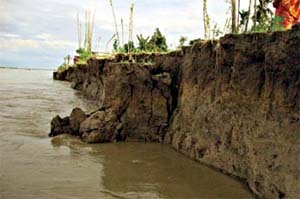 A devastating erosion by the river Teesta rendered over four thousand people belonging to about one thousand families of seven villages under three upazilas of Lalmonrhat district during the last three days. The Chondimari spar under Mohishkhocha union of Aditmari upazila is under the threat of Teesta erosion as about 200 meters of its protection dam has already been damaged in the erosion. Two top state-run entities of Bangladesh and India have signed a deal in New Delhi that would immediately pave the way for joint venture for a 1320 MW thermal power project in Khulna, with scopes open for another with equal capacity in Chittagong. Police fail to get convictions in a mind-boggling 90 percent cases, the Human Rights Commission chief revealed yesterday. The government yesterday made Hassan Mahmood Khandker, director general (DG) of Rapid Action Battalion (Rab), the new inspector general of police (IGP) by replacing Nur Mohammad after about four years. Country’s manpower export has significantly declined over the year alongside the reduction of remittance earnings during the last couple of months, statistics show. More than a hundred faulty and unfit launches are getting quick repair in Keraniganj dockyards to carry passengers on different routes ahead of Eid-ul-Fitr.